Your game server by default is not enabled and must be configured. Find the server required and click manage. 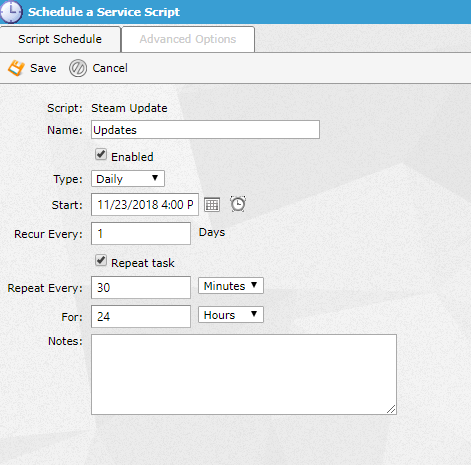 Select task type "Steam Update"
On the script schedule configure the update check to your liking. You should use the same settings above, but can adjust the "Repeat Every" setting to a smaller or longer interval encase you want the update to occur sooner or later after an update. Please do not set this less than 10 minutes. Ensure &apos;Update only if new version is available&apos; is ticked. You are all set to go with automatic updates and can rest easy that it is all taken care of. It is not advised to use this feature if you prefer to take backups prior to updates in case of issues caused by updating. Ensure you allow the process to complete fully and the server will come online automatically, trying to start it before it has completed may cause complications.